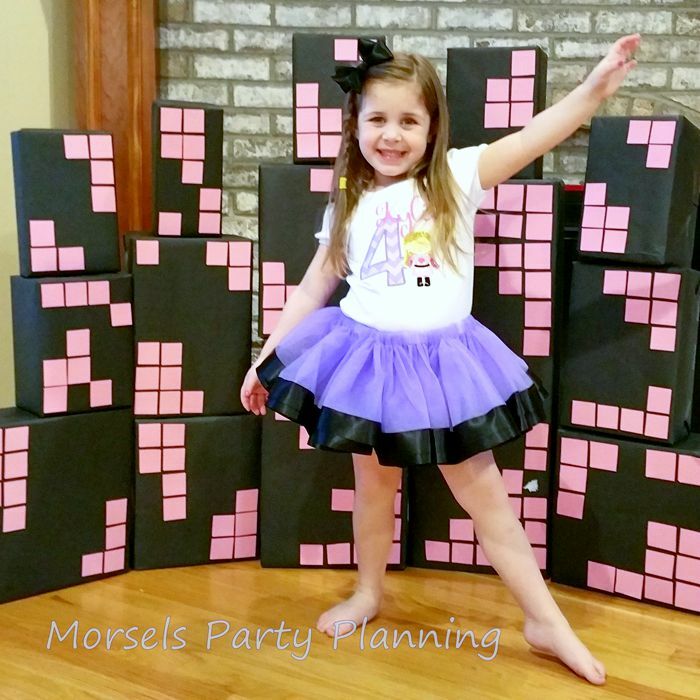 If you have a little girl with big dreams of being a Superhero when she grows up, then this party is for you. 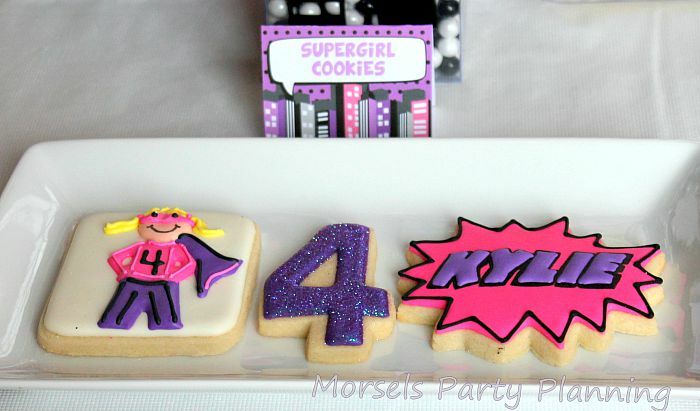 I styled this Girly Superhero Party for my daughter’s 4th birthday. The birthday girl requested that everything be pink, purple and black. The table was set with custom plateables from Create Ur Plate & designed by Morsels Party Planning. 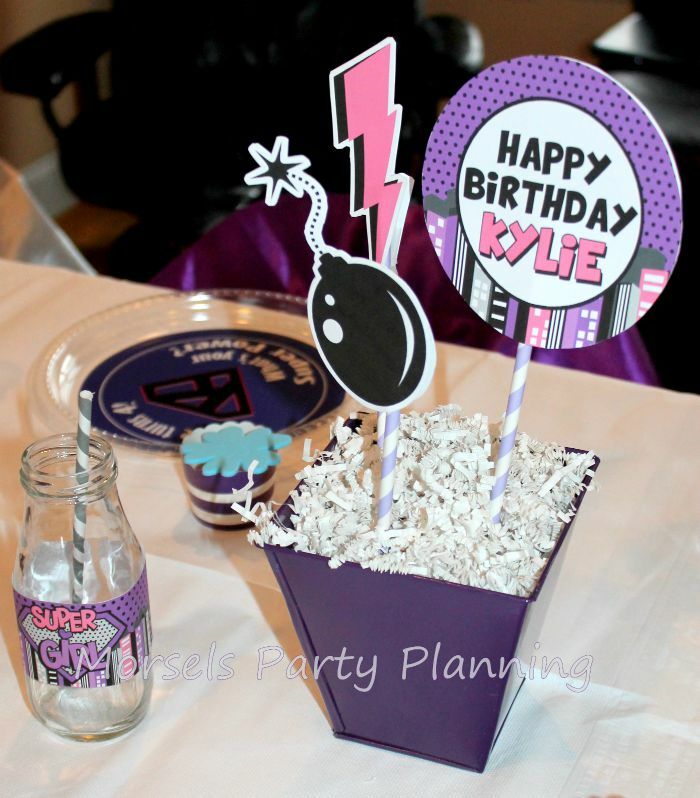 Printables from Funky Monkey Design added the perfect detail to our milk glass bottles, straws, centerpieces, dessert table and more. Each guest received a superhero mask at their place setting to decorate. Each chair held a satin reversible Superhero cape in either pink/purple or black/silver. My favorite feature of the party, and I’m sure you aren’t surprised, is the fabulous dessert table! 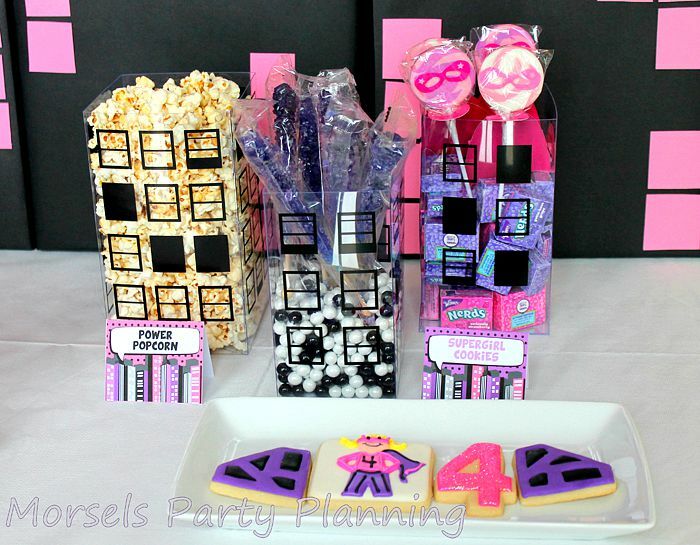 We superpower popcorn and various pink and purple candy. These sweetly perfect cookies are from Auntie Bea’s Bakery. They were delicious and beautiful, perfectly matching our theme. 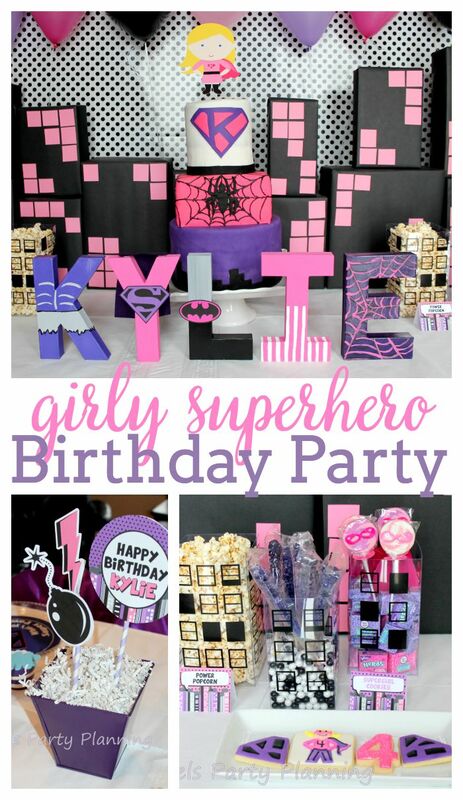 We created the custom name letters for the birthday girl inspired by all of her favorite superheroes. 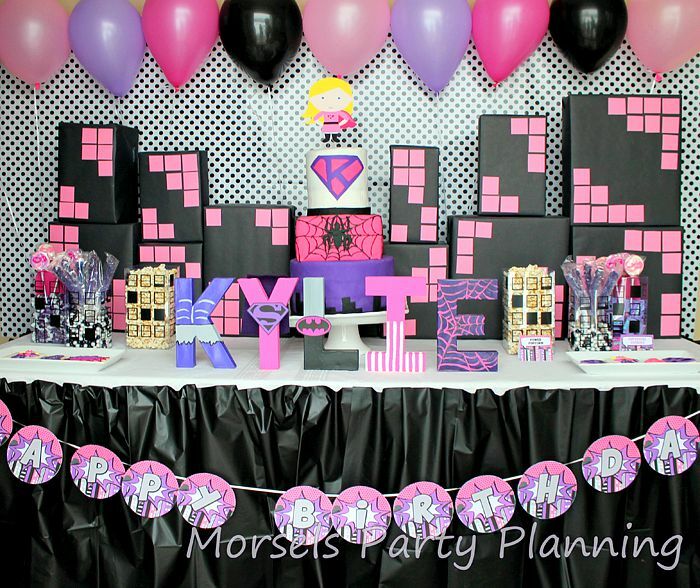 The centerpiece to the dessert table was a three tier pink, purple and black Superhero cake. 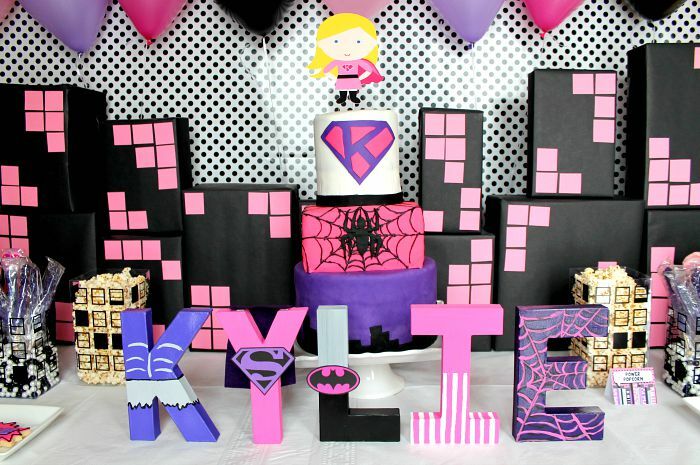 The first tier designed to look like the city at night, the second tier inspired by Spiderman who is the birthday girl’s favorite Superhero. The third tier featured a Super K logo and the cake was topped off with a custom cake topper by Pink Poppy Party Shoppe, designed to look like the birthday girl. The backdrop of the dessert table was a simple diy project of a city skyline with buildings. These buildings were also used as an activity for the kids, as they enjoyed putting their capes on and breaking through them like superheros!